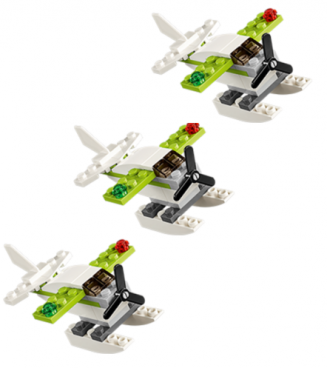 FREE LEGO Sea Plane Mini Model Build 6/7 & 6/8! You are here: Home / FREEbies / FREE LEGO Sea Plane Mini Model Build 6/7 & 6/8! FREE LEGO Bunny Mini Model Build 3/1 & 3/2! Get ready for the FREE LEGO Sea Plane Mini Model Build! Register online starting 5/15 at 9am EST (registration is on a first come first serve basis and space/quantities are limited). The monthly mini build takes place on 6/7 & 6/8! They’ll learn how to build this Sea Plane Mini Model and get to take it home! This event is intended for children ages 6 to 14 and while supplies last. The mini model must be completely built in store. Stores will no longer accept walk ups on the night of the event. **NEW FOR 2016: The monthly mini model build events are only open to registered LEGO VIP members. If you aren’t already a VIP member it’s easy to sign up! Just visit a LEGO Store to sign up, or sign up online.